When the two met, Martinez told quarterback coach Mario Verduzco on Monday he was going to play. 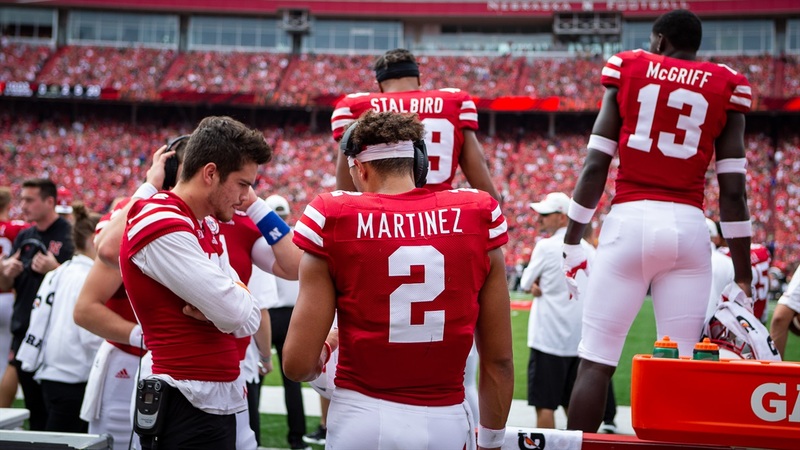 Verduzco just laughed and answered back “OK, I don’t think you’re the one that’s going to make that decision.” Martinez wants to play, “he wants to be out there for his teammates,” Verduzco says, but Nebraska will be smart with its budding quarterback. If he does play, it seems as if the coaching staff will adjust the play-calling to try and scale back the number of hits he takes. Martinez had 13 actual runs against Colorado, was sacked twice and took a few more hits after throws. But if Martinez doesn’t play, and the offense turns over to walk-on sophomore Andrew Bunch, what then? The staff still has plenty of confidence. The longtime quarterback coach has started a walk-on at quarterback before. He thought back to Eric Sanders at Northern Iowa (2004-07) who was a little like Bunch. “Had a good gun, really quick, really intelligent,” Verduzco said of the two. For Walters, it’s about the preparation. If, for whatever reason, Nebraska has to turn to quarterback No. 3, they’ll get walk-on freshman Matt Masker as up to speed as they can. Masker worked with the threes and fours during fall camp, but over this week of practice, he’s even seen some action with ones. “He’s done a good job,” Walters said. “We’ll find out where his level of understanding is at the end of the week and if he happens to get in, we’ll find a play that fits him and allows him to be successful. And in the event of a doomsday scenario and Nebraska needs another quarterback, there are contingency plans that will be in place. That’s pretty much right in line with what head coach Scott Frost said Monday. This staff has used multiple quarterbacks in short order before. In 2016, their first season at Central Florida, they played three in the first two games. Whether cornerback Cam Taylor, a converted high school quarterback, needs to be called on or something else, the coaching staff will be prepared. And hey, maybe some UNL students can go shoot their shot. >> Offensive line coach Greg Austin said the Huskers are rolling with six main guys on the line: the five starters and guard Boe Wilson. That could grow as the season moves along and they get more comfortable with other guys, but those are the main ones after one game. >> Against Colorado, Nebraska had two crucial drops. Wideout Stanley Morgan Jr. dropped a touchdown on the final play of the third quarter that would have put the Huskers up 35-27. Wideout JD Spielman dropped a third-and-16 ball from Bunch that would have given Nebraska a first down with a lead and less than five minutes to go in the game. Both plays had defenders in the area that either got a hand on the receivers’ arms or on the ball, but those are plays both have proved capable of making. Regardless, Walters isn’t worried about them. >> On the fumbles — because Nebraska lost two and had several other balls they put on the deck Saturday — Walters and the staff are taking a different approach, though. “Every week we have ball security drills and I think at times guys go through that and they take it lightly and they kind of just go through the motions,” he said. “We made it a point of emphasis this week and said, ‘Hey, this matters.’ Even when we go ball security, we can’t take it for granted. >> Running back coach Ryan Held ran through his running backs a bit on Wednesday. We’ll have a story on them shortly, but here’s a quick rundown. Held liked the performance from freshman Maurice Washington, now he just wants to see him get more vertical in his running. On junior Greg Bell, Held said his 45-yard run should have gone for six but he was too tight running with the ball. Held likened him to a 95-year-old running all tensed up. He’s not worried about Bell’s speed. On freshman Miles Jones, Held said he missed Saturday’s game with an eye injury but the expectation is that he’ll play this year. Held said this offense needs four or five healthy backs. It looks increasingly likely sophomore Jaylin Bradley will redshirt. Held noted there are several guys ahead of him on the depth chart. >> Verduzco spent some time with reporters breaking down Martinez’s lone interception Saturday. He said the first thing he noticed was how quickly Martinez went to make the tackle. It was no Drew Brown hit, but Verduzco liked the form. Verduzco was also pleased with their conversation on the phones right after. “He was very articulate with me with regards to what happened and sometimes when you see that on tape, it’s not exactly what he said, but what he said in terms of throwing that interception was what I saw on tape,” Verduzco said. “He wasn’t MSUing, you know what I’m saying? Verduzco shouldered the blame for the mistake as well, saying that particular progression needs to be outside-in as opposed to inside-out after looking at the linebacker. >> Walters wants to see the Huskers win the field postion battle against Troy. He thought penalties on special teams caused the offense some difficulties against Colorado. Statistically, the staff knows that if you start past the 25-yard-line, your chance of scoring goes way up. I'll have more on this later.